Since 1900 when the Zambian government started to privatize the mining industry, foreign mining companies have been taking advantage to secure investment. Konkola Copper Mines (KCM) is a subsidiary of Vedanta, a mining company listed on the London Stock Exchange, and is the largest copper producing mine in the country. Discontent has been growing as a result of constant degrading working conditions, the withholding of salaries, indiscriminate firing of people and worker mistreatment. Further, a report commissioned in 2012 by Foil Vedanta for the 2012 Vedanta AGM demonstration and produced by Southern Africa Resource Watch has revealed the ongoing pollution of groundwater for hundreds of people in the Shimulala community near Vedanta's Konkola Copper Mines. The Shimulala community, of approximately 125 households, is located near the Kafue River and due to its proximity to the mine operations is heavily polluted. The community is not able to draw water there anymore, despite it being the main source for domestic and farming water to the community. Also, all aquatic life has died. Meanwhile, Vedanta has a new project (KDMP) aimed at expanding the production of copper ore at the Konkola mine from two million tonnes per annum to 7.5 million tonnes per annum by accessing the rich ore body that lies beneath what the current operations have been exploiting. This involves the sinking of a new mine shaft to the depth of approximately 1,500 metres, the deepest new shaft sinking project in Africa. 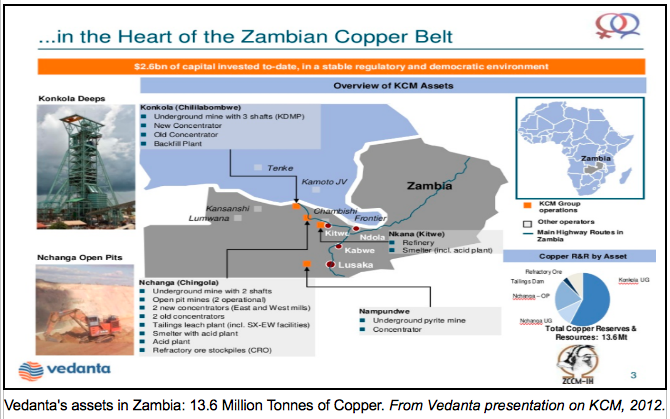 In May 2014 Foil Vedanta released a video showing Vedanta boss, and 69% owner, Anil Agarwal, telling a large audience how he bought Konkola Copper Mines in Zambia for just $25 million, rather than the $400 million asking price, and receiving loud cheers when he states that the company brings in $500 million in profit each year from the mine in contrast to claims from the CEO that KCM was making a very low profit or a loss due to high operational costs and taxes. Vedanta's last set of accounts show a US$15.9 million operating loss from its Zambian operations, with a US$63.6 million profit the year before. The news has set off protests in Zambia and in London. A protest at the Zambian High Commission in London following this news called for Vedanta and the Zambian government to release KCM’s annual reports, containing the official figures on profits and tax payment, which are currently kept secret. They also suggested that Vedanta should be forced to pay the fine of $2 million served by Zambian courts in 2011 as compensation to 2000 claimants poisoned by major pollution of the river Kafue in 2006, and stop ongoing spills affecting Chingola residents. In June 2014, The Zambian Revenue Authority announced a formal audit after comments by the company’s chief executive sparked fury in the capital Lusaka. Project Details Vedanta owns 79% of the mining operations in Zambia. On average it takes about 100 tones of ore to produce 1 tonne of copper. Current production is 2 MTPA, to be increased to 7.5 MTPA. The KDMP also includes the commissioning of a 6 MTPA concentrator. Since 2004, it has invested $2.7 billion in Konkola, upgrading mining facilities and increasing its resource base. The company’s website reports that these operations delivered 160,000 tonnes of integrated copper production in the financial year 2013 and 216,000 tonnes of total finished copper production. To ensure that the Mine puts up piped water in the community for both agriculture and Domestic, as they had the right to access to clean and safe water. If the water situation cannot be improved, there is the need to relocate the community to a more habitable location. The health conditions of the community should be examined, so that adequate medical attention is given. The Mine (KCM) should improve its behaviour towards the welfare of the local community by being responsive and addressing community needs on time. Why? Explain briefly. The community demands have not been met and the fine has not been paid.